You can find Songbird Designs in real life at a variety of Auckland craft fairs, including Crafternoon Tea and the Devonport Craft Market, and of course you can check out their awesome felt store http://www.songbird.felt.co.nz/ - if you are quick, you might get something in time for Christmas! Congratulations! There will be another competition probably next week I think. Oooh, this is good! The Vintage Purls samples are here! And even more exciting - there are two different samples - a superwash merino/nylon sock yarn that might as well have my name on it (actually it does!) - this is totally my colour scheme - I LOVE this sock yarn! (I'll have to design a pattern just for this yarn). It's an extremely generous sample too, approx 20g. 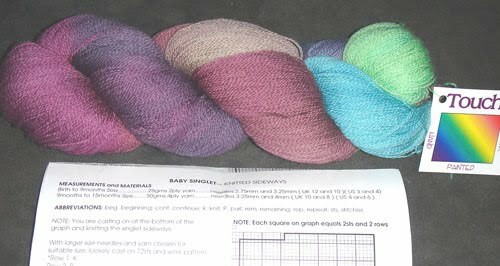 And other other sample is some NZ Merino hand dyed fibre in beautiful soft grey/lilac/bluey-grey. It's also approx 20g, so there is a good amount to spin up or craft with. I really must learn to spin - that's my summer goal (along with finishing my sock book). Have you visited the Vintage Purls website lately? I went to check it out last week and discovered it was totally my lucky day as the Summer Sock Club had only just been loaded, and I managed to buy one! I can't wait to see what the colours are. If you need some sock yarn for a summer holiday project, order some right now - consider it a gift from Santa. I'm sure you've been good. 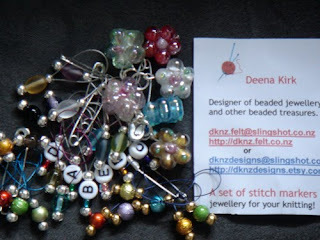 Deena Kirk is a designer of beaded jewellery and other beaded treasures, and she has sent in a sparkly selection of stitch markers! 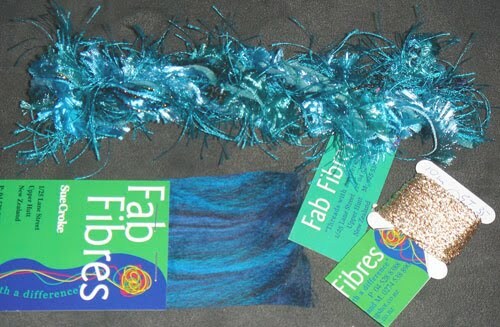 This picture shows a few of the designs - there are lots, and you are going to love having a bit of glam in your knitting. You can find more of Deena's designs at dknz.felt.co.nz and dknzdesigns.etsy.com - and of course you can see her in real life at craft fairs around Auckland. There is still time to buy Christmas presents! Check out her felt and etsy store and pick up a few last minute Christmas gifts. 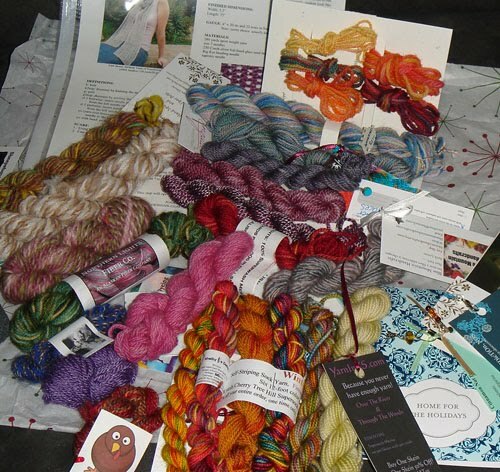 Here is something for all you crocheters - the NZ Yarn Sampler Box is not just for knitters! 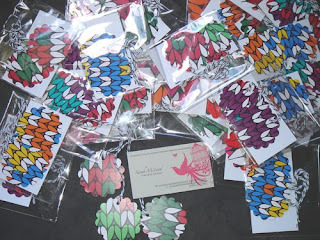 Marshmellowmagic Designs have sent some absolutely gorgeous samples - beautifully presented in an organza bag. 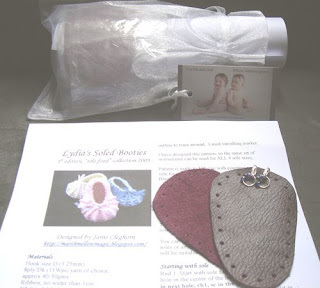 There is a pattern to make super-cute baby booties, plus the leather soles already punched so you can make them immediately. AND... there are even two lovely crochet stitch markers as well! This will be the very first completed item you can make with your sampler box - just choose any of the lovely yarn samples, pick up your crochet hook and before you know it, you'll have a pair of cute booties. I expect to see lots of photos of completed items in our Ravelry group forum! 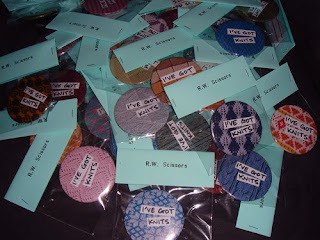 RW Scissors Samples & Giveaway! Moving right along... RW Scissors have a couple of prizes to give away! 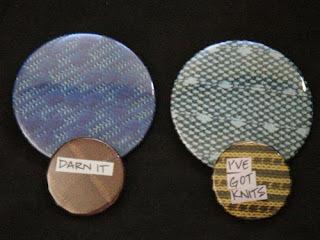 Up for grabs are two sets of badges - a large knits badge, and a small 'Darn It' or 'I've got knits' badge. All you have to do is tell me which craft fair you can see RW Scissors at this weekend. Email me your answers at blendy@blendy.co.nz by Sunday 20 December 9pm NZtime, and hopefully the winners will get their prize in time for Christmas (if in NZ - international entrants will take longer to arrive). Make it a handmade Christmas and shop at local craft markets! I hope you made it to Craft 2.0 last week - I was sad to have missed this one. The Porirua Christmas Carnival Under The Canopies on Saturday December 12th 11am till 3pm. Crafternoon Tea Saturday 12th December 2009, 10am-3pm at the Mt Eden Normal Primary School Hall, Valley Road, Mt Eden. 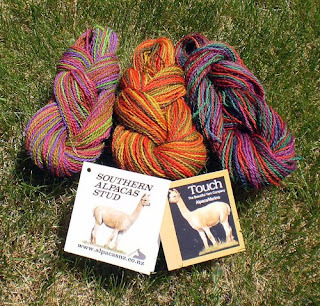 Here is a real treat from Southern Alpacas! What vibrant colours - and perfectly named to match the colours of a summer garden: Lovely Lavender, Sunburst of Poppies, and Pretty Pentstemons. These hanks are hand-dyed 2 ply yarns – which are incredibly fine, and they go a long way. They have clean raw fibre in a dozen natural shades, and washed and carded slivers of pure alpaca fibre, in natural colours. 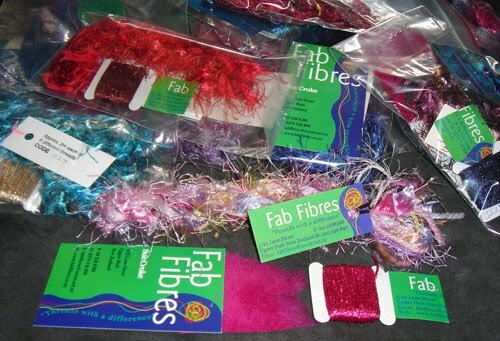 They also blend natural coloured alpaca with hand-dyed silk for luxurious blends in fabulous bright colours. This year the range is luscious and almost edible – raspberry, bananaberry, apricot swirl, blackberry, black spice, and lavender. 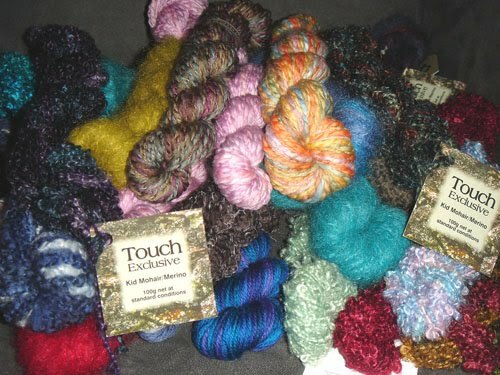 I could just snuggle up with this wonderfully soft box of samples from Amy at the Loop Knittery. They are just gorgeous! There are 12 different colours in this 100% New Zealand made Merino, spun in Canterbury and hand dyed by Amy. 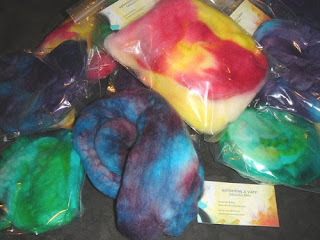 It is a single spun "felted" yarn, a fine 23 micron, gorgeously soft Merino. This yarn is perfect for jerseys you want close to your skin, places where other yarns don't dare to go! This is a versatile wool that begs to be touched. And as an exciting added bonus, each generously sized sample comes with a couple of lovely stitch markers, and a needle inventory chart! Now THAT is something I totally need. It's a handy little chart where you can mark off what needles you have in your collection, and what type of needles they are (eg metal, bamboo etc). Thanks Amy!! I had to take a quick deviation from working on my sock book because it's nearly Christmas, and a handmade tree is the best kind. 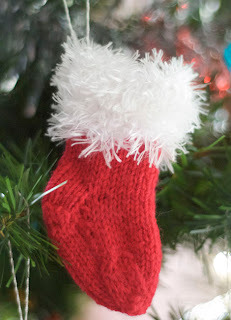 I've written 5 patterns for knitting your own cute little mini stocking decorations - for your tree, or give them away to your friends! And the best part is they use up all your little bits of leftover yarn. 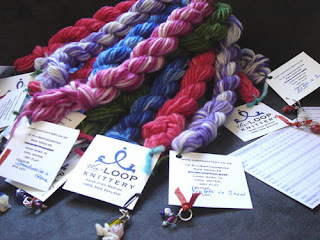 Here's something amazing for all you spinners - samples from Spinning A Yarn! Jessicah has submitted three bright colourways of Merino Sliver 'Venom Green', 'Hydrangea', and 'Californian Poppy'. They are dyed with wash and light fast Jaquard Acid Dyes. I can't wait to see what these look like when they are spun! I'm not a spinner, but I think I'm going to try out a drop spindle and see how that works. Once I've got the technique down, I'll spin up the Hydrangea sample - it is all my favourite colours. 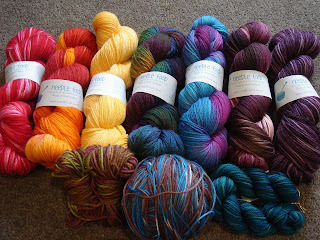 We are very lucky to have Anzula yarns as one of our specialty US suppliers to our NZ Sampler Box! 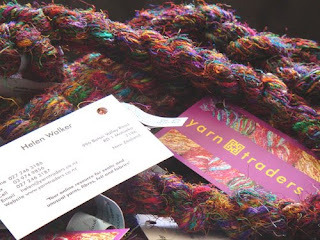 They carry yarn from lace weight to worsted & all kinds of luxury spinning fibers. 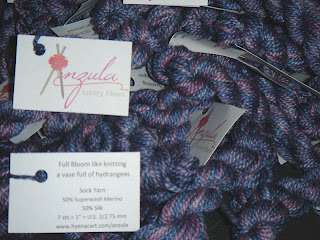 Anzula are going to be contributing silk & superwash merino sock yarn - sounds delicious! 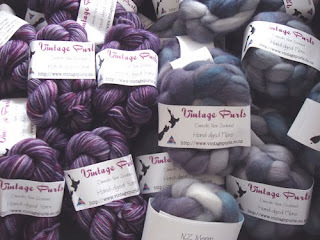 Our list of suppliers for the NZ Yarn Sampler Box is growing fast - check out the list. Wow, this concept is really taking off and every day I am receiving confirmation from more suppliers who want to contribute to the boxes! I'll have a full list of suppliers soon, but in the meantime, check out the current list at http://www.blendy.co.nz/suppliers.html - and I have more to add as well! At this stage, I anticipate the price of the NZ Yarn Sampler to be NZ$35 (approx US$25) plus shipping. This is approximately in line with the EweBeaut Sampler, and is cheaper than the PhatFiber Sampler. So as a guide a box sent to the USA will be NZ$35 + 15 = NZ$50 which is about US$36 at today's exchange rate. I received my Yarn Sampler from Ewe Beaut in Australia this week! It is just like Christmas opening up a surprise package of amazing samples of beautiful yarns and accessories. 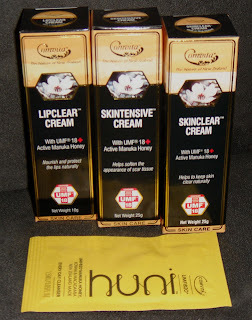 I've already checked out several of the websites so I can buy more goodies (it's a little bit dangerous really!). I particularly like the various sock yarns, and I have designed a perfect sock pattern to make use of the samples! Once I've knitted up my samples into this sock, I'll take pictures and will include the pattern in my Sampler Box. 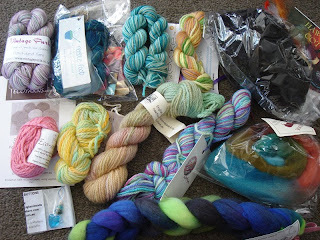 Blendy's New Zealand Yarn Sampler Boxes are getting underway with some great support and interest from an amazing selection of yarn and knitting accessory suppliers. Check out our website www.blendy.co.nz for more information and to register to buy a box! 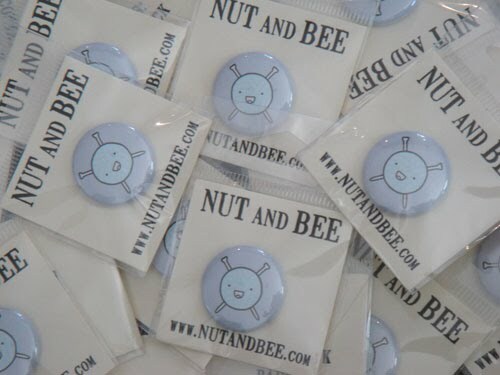 This blog will be used to update you with photos of samples that will be in the boxes, special promotions from suppliers, and more. Join our ravelry group to take part in discussions.